Discussion in 'iPhone and iPad Games' started by Boardumb, May 23, 2016. Pick up your ticket to punch town, and don’t forget to pack your fists! 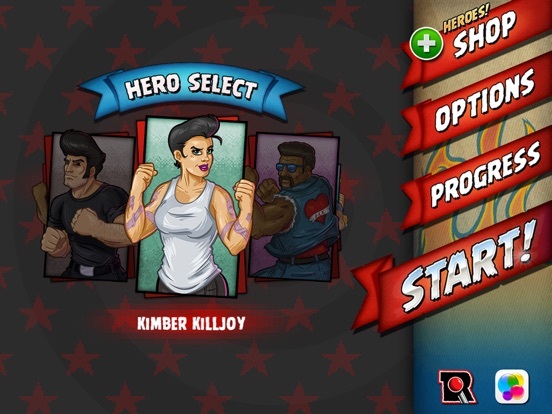 Rockabilly Beatdown is an “endless puncher.” See how long you can survive a constant, ever growing stream of enemies by punching like your life depends on it - because it does! You’ve got to think fast and hit faster to last as long as you can. Every connected punch is the one that keeps you on your feet and only the best brawlers can brag about bringin' the boom... Will you go down in history as the one punch who pummeled them all? FEATURES: - Three heroes ready to throw down! Choose from Kimber Killjoy, Ace Knuckles, or Bruiser McFist! 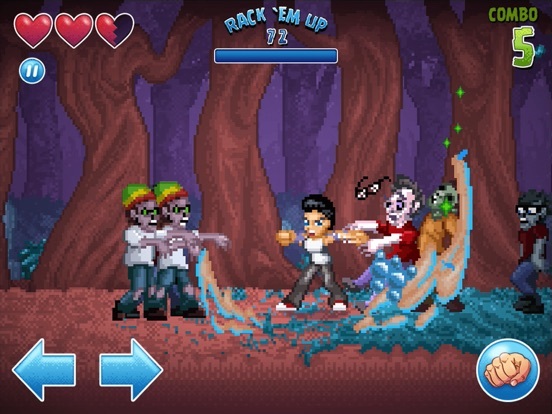 - Loads of endless enemies are out to get you, with bosses tossed in for double trouble! 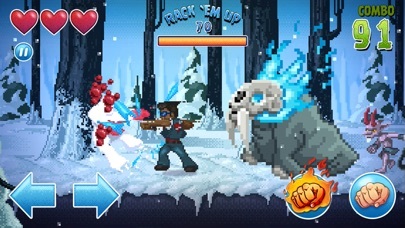 - Six crazy cool levels to punch your way through! 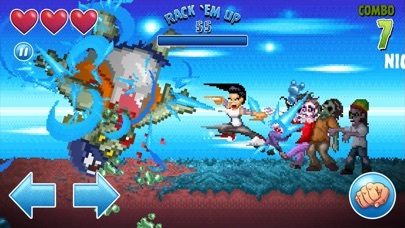 - Every punch builds towards your ultimate super move: PUNCHTASTIC! 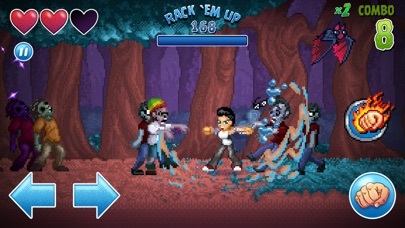 - Run up your combo count to reach Punchtastic even faster! 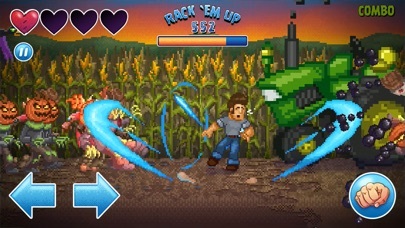 - Keep an eye out for lifesaving pick-ups and enemies that endow special bonuses! - Tally up your totals and collect Fist Rewards after every game! 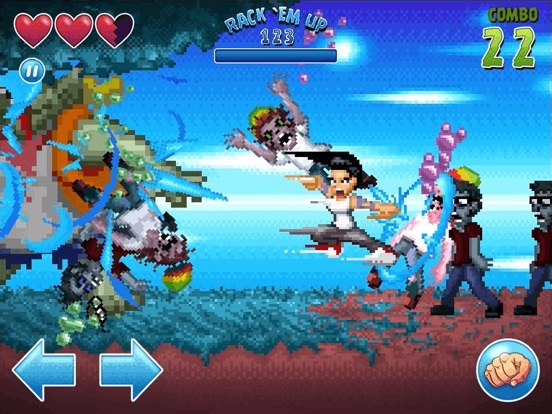 - Super sweet pixel art to channel that classic arcade action feel! 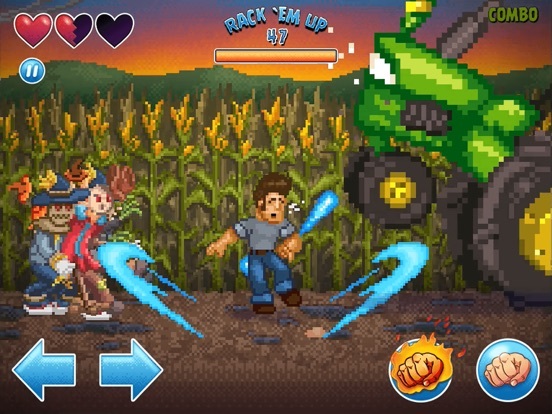 - Unlock costume colors and more special levels through gameplay! Load up, lock in, and get ready to work those guns - yer' gonna need ‘em to be the best! OPTIONAL IN-APP-PURCHASES: - Goldie Luxe Pack: Includes new hero Goldie Luxe with two levels: The Lumbearmill and Lumbermare with Lumbearjack enemies! - Jenna Von Jett Pack: Includes new hero Jenna Von Jett and two levels: Creepy Catacombs with Katacomb Krew enemies and Himalayan Hideaway with West Side Swamis enemies! - Kondo Kazuki Pack! Includes new hero Kondo Kazuki and two levels: Jigoku Station with Sinister Salarymen enemies and Bushido Bullet with Kawaii Killers enemies! - In-App Purchases are for your enjoyment of new heroes and levels; core gameplay is not affected or enhanced. 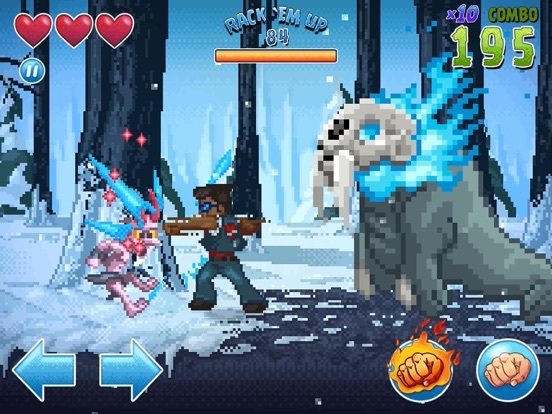 Looks interesting, love the pixel art. But I'm not sure about the gameplay...endless? I'd like to see it more level based. And what about the updates, are they free or with IAP or both!? "Future game updates will include free new heroes, new levels, and new enemies!" "Future game updates will add new In-App-Purchases for more heroes, levels, and enemies!" @Bourdumb: Hi! This is the dev, thanks for posting our game! @ Sash-0: For our planned updates, the answer is BOTH. Some content will be free and some will be IAP. 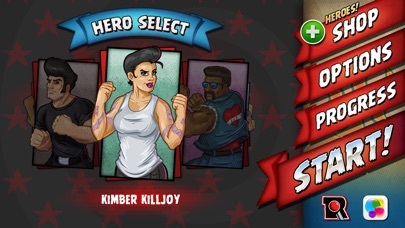 For our next update, we have two new heroes with two new levels each as IAP. A new level or two will be free. We're not sure yet if the free content will include a hero this next round, but free heroes are definitely in the future. As for level based play, we've put alot of thought into it and right now the "beat your best" works really well, especially on mobile. But we've certainly thought about progressive, story-based play and would like to expand on it as the game grows. Ok I'm in. I Just hit the buy button. I'll play for a while and then post my impressions. If Billy's in, I'm in. I've been playing for about 30 minutes. Am I missing something because I see nothing to unlock by playing. There's nothing to upgrade by playing. All I've seen and experienced is score chasing. Is this intended? @ LordShad0wz: Yes, it's simple by intention, no upgrades or unlocks. Filling out the Fist Rewards page is the primary goal for higher scores. Totally understood if that is something you would like to see. But a 30 minute session is no slouch! I'm not going to give the game a star rating right now. The reason is I'm completely torn. I don't want to just give a bad score, but at the sametime I can't give it a great score. Things can be addressed with updates so I think I will wait to see what happens with the first update before I give it a star rating. With that said let me get into the review. I am very honest and blunt when I discuss things. It's not to offend. It's so that things can be made better and so everyone knows exactly what I mean. Let me get to the good first. There is actually a lot of good. First the pixel art. Wow. I love it. Give me more please! I love the styling and the level back grounds and the enemies. The combat itself is fantastic. The floating power ups are great and blasting through enemies is very satisfying. Sometimes when you punch an enemy they fly towards the screen and splat the screen. I love that effect! The on screen controls work perfectly and I like them a lot. The buttons are all instantly responsive. I love the combo and multiplier system. The game does get pretty intense when the enemies come fast from both sides. There are different characters to choose from including both sexes so that's awesome too. In terms of art and gameplay this game shines and is fun! So now I'll get to what I didn't like. They charge up front for the game. I understand it's only $1 but still this is a pay game. There is absolutely nothing to unlock. No new outfits or power ups. Absolutely nothing to obtain. There's nothing to upgrade. There's simply nothing. On top of that you are greeted with further IAP for more characters and outfits. There's absolutely nothing that is provided for players that just paid for the game to obtain or upgrade or keep you interested in playing. This has turned me off so much that I absolutely will not purchase that other IAP on principal. There needs to be more than just punching to keep me interested in playing. You should have some way for paying customers to obtain outfits or some upgrades for the power ups without having to pay again. If this was in there I would I already purchased the other IAP. That's the truth. Again this can all be addressed. The core game is awesome. But it needs more especially when I just paid for the game and there's just nothing I can obtain without paying again. Billy, thanks for your detailed impressions. I was wondering about...guess what!? If there are GC achievements..
@ LordShad0wz:, It is awesome that you took the time to purchase, play, and write about our game and we are happy you did. For what you didn't like, we get it. And hey, we're listening. The the game can grow in ways that may be more appealing to you and hopefully keep you interested. If your paragraph listing the good of the game is any indication, it sounds like (and we want to believe) you did get your money's worth after all, that being $1. That's not a facetious statement either, your purchase represents an investment into something we created and worked really hard for you to enjoy. IAP heroes and costumes are optional by design: players can't buy their way into higher scores, but they may like a change of scenery. Future updates will offer more content, free included. Should obtaining more content or abilities via gameplay and unlocks be a continuing theme in feedback, we absolutely are going to see what can be done to work that into the design. Again, thank you for the time spent with our game and your feedback, it means alot to us. Keep on punching! ... If there are GC achievements..
@ DonnyDJ76: There is a full suite of Game Center achievements to punch your way through! Thanks for the response. Did I get my money's worth? Yes and no. It was your choice to only charge $1 for the game. I completely agree that keeping the leaderboards fair is a key and important aspect. I wouldn't want to buy my way to the top either. However. Looking at your game besides punching what is there for me to want to keep playing? I played for about an hour total. I've seen all there is to see. There's nothing for me to achieve. The only new things I can see if have to pay again for. I got some massive combos and I saw all of the backgrounds and that's it. I haven't felt the need to pick the game up again. If you had provided some stuff to unlock or some stuff to upgrade I would have a reason to keep playing. I also would have definitely purchased that other IAP just to send some money you're way. As I said the core of the game is beautiful. What you guys made is actually pretty awesome. But you should have provided some outfits and stuff to unlock by playing along with the IAP. To keep people that just paid interested and believe me if I'm interested I'll pay more. Check out my other threads. I spend a lot in games. My post is to help you not offend. @ LordShad0wz: All cool. We're crazy excited having released our first game, and just love hearing people talk about what they would like to see. We're already talking about how to incorporate unlocks and how they might work. To those reading/playing and wondering if there is truly "nothing left to achieve," we humbly direct you to the Fist Reward collection accessed via the Stats Menu-- tap the little bouncy fist banner. There are 30 that get cooler as they go, plus some secret reveals. Gotta punch them all! Also we've mentioned there are a slew of actual Game Center Achievements, 24 of them. When we launched, I reset all my stats ("I" meaning Eric, who is writing this), and my current best is shown below. Try and beat that, if you haven't already! Really enjoying the retro feel of this game! It's surprisingly hard to get a high score. Excited to see what the updates bring! In the meantime we have some leftover App Store download codes that are about to >> EXPIRE JUL 14 << so grab them now while you can!